The Nurture Studies reminded me of the story of J.E. Weaver, who I first read about in the excellent book Gardening with Prairie Plants by Sally Wasowski. Prairie plants are, of course, oh-so-fashionable now in gardening circles, but when they were just part of a place, not of a garden (and the current mistake is to make them more of-a-garden than of-a-place) they were a subject of incredibly focused study by John Earnest Weaver, a member of the University of Nebraska from 1932 to 1952. 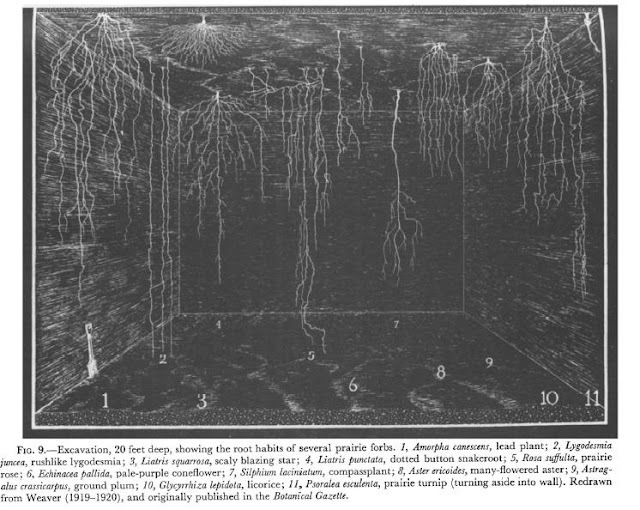 Weaver developed a laborious, painstaking technique for exposing and drawing a network of prairie roots in situ--a labor that must have suited his own precise personality for he conducted his field research wearing a three piece suit and a green eyeshade, like some accountant who had lost his way in the country. 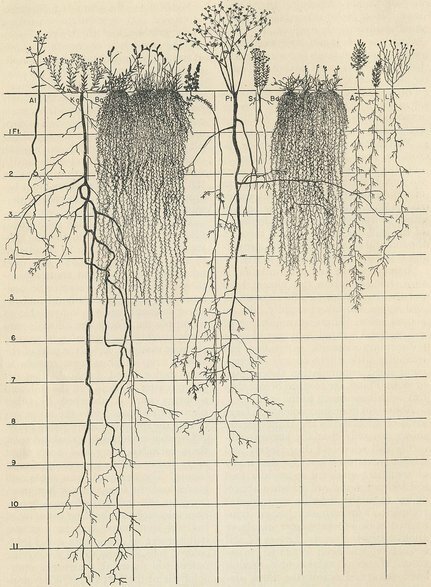 He drew the roots in great detail, documenting them at depths of up to fifteen feet from the ground surface. 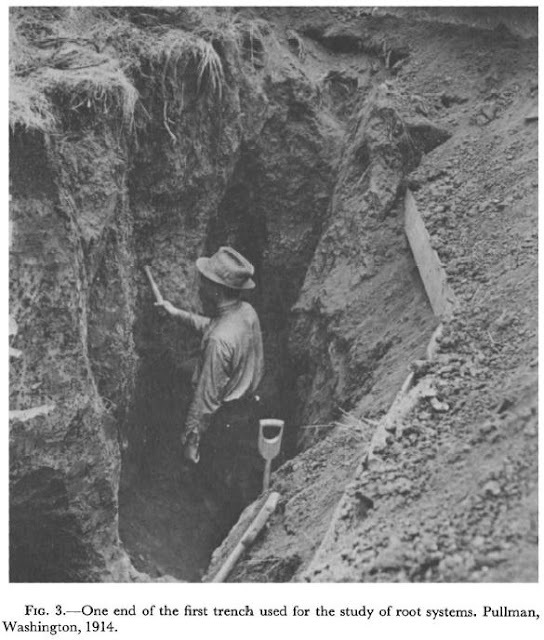 Later, he paid his students 25 cents an hour to dig the trenches (1500 trenches for one four-year study alone), stretch a grid with string and nails against the freshly exposed root bed, and draw. Occasionally photograph, but mostly draw, and I particularly love his three-dimensional reconstructions which subterranea are just as beautiful as art as they are as data. Reportedly, even his wife called him 'Dr. Weaver', and he read nothing but technical literature and never engaged in small talk. His obsession was prairie plants and their root systems, documented in 12 monographs, 8 books, and some 90+ scholarly articles, some of which are available at the University of Nebraska archives with engaging titles like "The Wonderful Prairie Sod". His studies were crucial for coming to understand the dust bowl, and why agricultural plants were not as successful as the native prairie in resisting drought and combating erosion. They record plant distribution and varieties in prairies that have long since vanished. And gardenhistorygirl advises that they should be read by those who are attempting to recreate a prairie landscape in say, Oxfordshire. Or on a rooftop in Brussels. As for my own prairie I leave a wide band of the native grasses unmowed, encircling the house like an oval racetrack, the price of which is that switchgrass and bluestem occasionally (okay, every spring, actually) seed into my flower and vegetable beds. I now understand why it is so difficult to weed out. Thanks for that good post about an interesting man doing... interesting work. Seems a bit of an autistic character! Thank you. Thank you. Now I have a better idea of what some of my silphiums are doing underground. Wow! This is so cool. Those images are amazing, and what a fascinating character. Love this! I have a book somewhere with a similar diagram with a range of prairie plants and grasses...probably was taken from his research! I'm actually fascinated by it...and it really shows how 90% of the plants in a prairie are underground...which also explains how wildfires were key in preserving the prairie...the roots went deep enough to be protected. I read somewhere else that a certain percentage of the roots of Big Bluestem die each year, opening up channels for water. 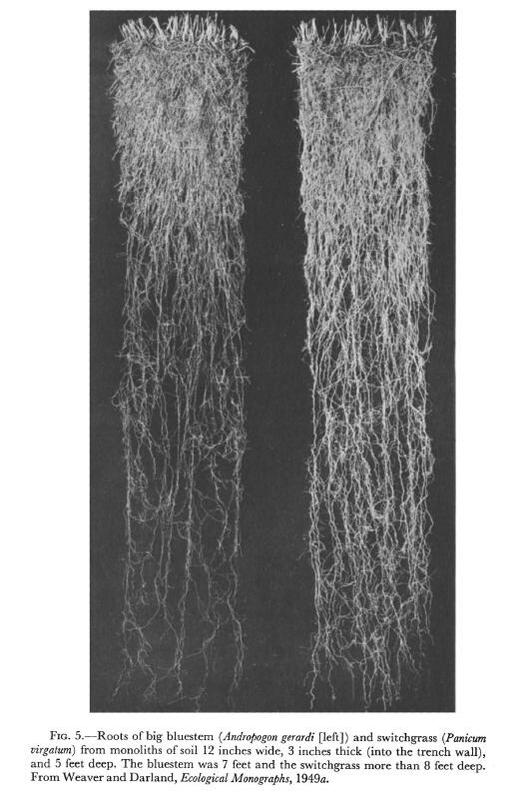 Thanks for this great reminder - both of the complexity of root structures and of the people who study them!